Zimbabwe's 100,000 percent inflation rate is the world's highest. 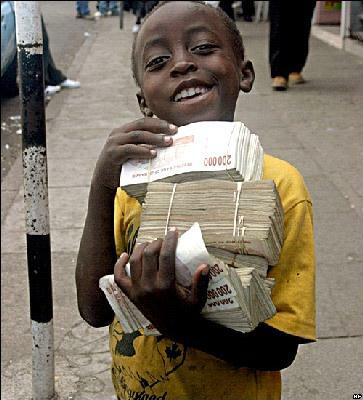 While officially, one U.S dollar is worth about 30,000 Zimbabwean dollars. As of last week the real price on the black market was about 35 million dollars, or 1,166 times the official rate. The average wage for a farm worker is 30 million dollars per month. A domestic worker makes about five times that amount, and a laborer in one of Zimbabwe's decrepit factories can expect to earn as much as 300 million per month. It sounds good until you consider how much things cost. Four Coca-Colas cost about 20 million. A one-way bus ticket around town will set you back one of those 10 million dollar notes (and that price may go up even as you're on the bus). Ten kilograms (22 pounds) of corn meal, which might last a family of four two or three days, goes for 45 million. It's 7 million for less than a quarter pound of low-grade beef. A loaf of bread is 10 million. The only good thing that can come out of this is a revolution. Similar extreme circumstances led the Germans a stray and helped the Nazis gain power.. but at least here they *already* have a "Hitler" like dictator in place... so let's hope they get rid of him this time.